There is no sincerer love than the love for food, said George Bernard Shaw. And we experienced this recently at Asado, the South American Steakhouse in Sheraton Oman. A lively and stylish steakhouse, Asado has been a favourite of steak and meat lovers since its launch a couple of years ago. The restaurant recently underwent a menu change incorporating signature dishes, classics and reimagined plates. Walking into Asado, one of the first features about the ambience that captures the attention is the woodcrafted interiors. 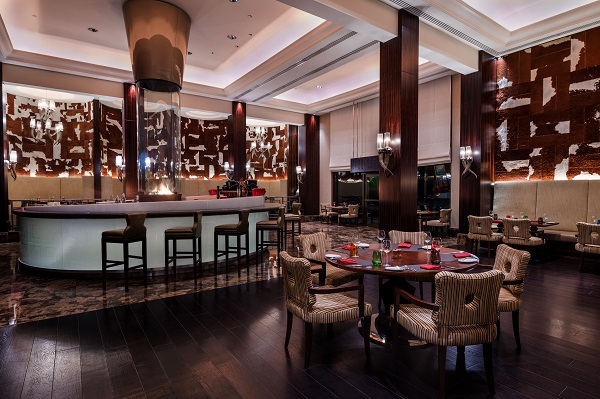 The cow hide panels on the walls is atypical of a steakhouse yet crafted to give off a chic feel. 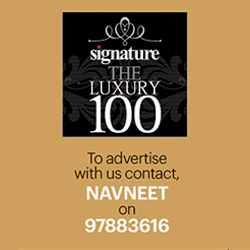 The seating is more casual and also features a special centre bar style space where once can watch the chef whip up some delicacies. But it’s the private booth that caught our fancy. The menu is quite extensive featuring dishes that encapsulates the spirit of South American cooking. We began the meal with one of Wagyu el Matador tartar which the Chef created by our table. The finely cut wagyu was blended with an aioli that was made at our table and served on a platter accompanied by avocado, pickled mushrooms, and jalapeños. The freshness of the beef tartar comes through even though the aioli; adding zest to the dish is the pickled mushrooms that explode in the mouth in a melange of flavours. The ceviche is a specialty of Asado and nothing is more refreshing than fresh seafood cured in citrus juices. Preparing dishes right in front of the diners is one of the attractive elements of Asado. The ceviche is prepared at the central dining area that sports a bar style seating. The chef prepared a ceviche with seabass, orange mix and leche de tigre that balanced the delicate flavours yet had a lovely zest. We also tried a tuna ceviche that was blended with cucumber, sweet potato and quinoa. Our favourite was the first ceviche dish. Empanadas are a staple in the South American cuisine and Asado has a few choices. We had chicken empanadas that were crispy and full of flavour but the winner was the Provoleta that packed in all the goodness of caramelised onions, melting cheese, jalapeno and roasted pepper. A steakhouse’s reputation is decided by the meats served. Of course, other factors like the cut, temperature and serving matters too. Going by Asado’s impressive range of dishes served so far, we were certain that the team would not disappoint. The first dish from the mains to arrive was the Signature Slow-Cooked Beef Cheeks. Cooked for 48 hours, the beef cheeks have an incredible melt-in-the-mouth texture. The accompaniments – quinoa, sweet potato puree and sweet plantain chips – perfectly compliment the succulent dish. Up next was another signature dish – Tomahawk Steak. 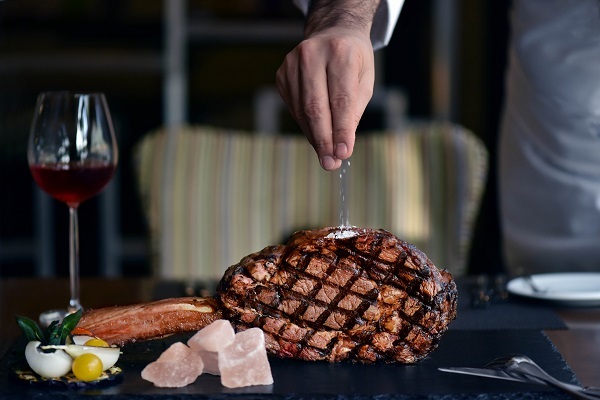 A prime cut piece of goodness and all of 1 kilo, obviously to be shared, the Tomahawk Steak’s final preparation is at the table. The tender steak is brought on the bone to the table where the chef coats the meat with flamed rosemary sprigs. He then cuts the meat and serves it at the perfect temperature. The Tomahawk steak is tender and delicious; the hint of rosemary adds a fine touch to the meat. After this sumptuous spread, we had half a mind to decline the dessert options but the team at Asado insisted and we were glad we went with their suggestions. We were served Chocolate Melt Down Cake and Brazilian Mango Mousse. Fresh and light, the Mango Mousse packs in a burst of flavours topped off by the sweetness of mangoes. As for the Chocolate Melt Down Cake, it is one of the best chocolate dishes we have ever had – rich, fudgy and moist, the cake made for a wonderfully sweet ending to the meal at Asado.